Some 42 Bishops of the Ukrainian Catholic Church gathered in Lviv-Briukhovychi, Ukraine from September 2-11, 2018. They came from Ukraine and the diaspora - i.e. the countries of Central, Northern and Western Europe; North and South America; and Australia. Metropolitan Lawrence Huculak, the Archbishop of Winnipeg was also in attendance, along with other Bishops from Canada. During the opening and closing Hierarchical Divine Liturgies and during Synod sessions, they were joined at different times by representatives of other Churches - the Apostolic Nuncio to Ukraine Archbishop Claudio Gugerotti; the President of the Roman Catholic Bishops Conference of Ukraine Archbishop Mieczyslaw Mokrzycki; a representative of the Ukrainian Orthodox Church (MP) Archbishop Philaret (Kucherov); representative of the Kyivan Patriarchate Archbishop Dmytrij (Rudyuk); the newly appointed Archbishop of Reims, France Most Rev. Éric Marie de Moulins d'Amieu de Beaufort; Bishops Milan Sasik and Nil Lushchak of the Eparchy of Mukachevo; Archbishop Ihor (Isichenko) of the Autocephalous Ukrainian Orthodox Church; Archbishop Roland Mennerath of Dijon, France; the Apostolic Exarch for Byzantine Catholics in Greece Bishop Manuel Nin; the Vicar of the Archbishop of Madrid for Eastern Catholics in Spain Rev. Andres Martinez Esteban; Archimandrite Sergiusz Gajek the Apoctolic Visitator for Eastern Catholics in Belarus; as well as other Bishops and dignitaries, especially during the three major Hierarchical Liturgies in Lviv and Peremyshl. After the Divine Liturgy at St. George Cathedral in Lviv, the Bishops moved to the large retreat complex in the suburb of Briukhovychi where they prayed an opening moleben' invoking the Holy Spirit. At this time, each bishop and Synodal staff members made an oath of confidentiality and dedication to fully realizing the goals of the Synod. This latter part was led by the most senior bishop present - Bishop-emeritus of Stamford M. Rev. Basil Losten, who is a bishop now for 47 years. The opening formalities and first working sessions began the next morning on September 3rd, with greetings from Pope Francis via the Apostolic Nuncio to Ukraine as well as from the President of Ukraine's Roman Catholic Conference of Bishops. A special source of joy was the presence of representatives from all three of Ukraine's major Orthodox jurisdictions. They also brought greetings and were present at the Synod in various ways. This year, the Synod gave special attention to the vast Ukrainian Catholic membership that has developed outside of Ukraine over the years and especially in the last two decades. Of course, the bishop-members themselves reported from countries where Ukrainian immigration was established as early as in the 19th Century, like in Canada. However, due to the mass migration in recent years of many hundreds of thousands of Faithful of the Ukrainian Catholic Church to many countries beyond Ukraine's borders, the Synod Fathers gratefully received reports from those countries were the new migration has been extraordinarily significant - like France, Spain, Italy, Kazakhstan, Austria, etc. His Beatitude Sviatoslav, gave an account of the historic visit of Pope Francis to the Ukrainian Catholic Basilica-Cathedral of Holy Sophia in Rome, where the Holy Father acknowledged "the heroic service of Ukrainian women for Italian families". Immigration was an important secondary theme of this year's synod. 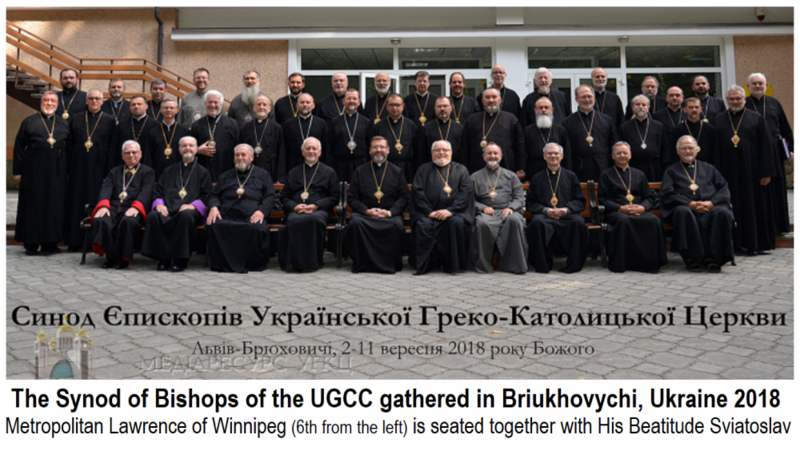 The Bishops heard and discussed various reports and subsequently accepted the resolution that the 7th Church-wide Patriarchal Sobor (Council) be held in 2020 with the theme, "Migration and the Global Unity of the Ukrainian Catholic Church". The main theme of this year's annual Synod was, "The Word of God and Catechesis". The focus was on the Church's mandate to Evangelize and bring Gospel message of Salvation to all peoples. However, throughout the many discussions and deliberations over a number of the sessions the goal of the Bishops was to provide the opportunities and resources that all members of the Church themselves would better know and understand the Sacred Scriptures and the teachings of Christ's Church through catechesis. The opening keynote speaker for this topic was the head of the Patriarchal and Synodal commissions on catechesis, Bishop Peter Stasiuk of Melbourne, Australia. The Synod developed and made appropriate decisions to provide the appropriate resources and encouragement in order that, "the Faithful of the Ukrainian Catholic Church would live the Word of God in their daily lives, and that the passing on of the faith would be a priority of Church life. Catechesis is the first obligation of every bishop, priest and parent". The Synod also looked at the progress of the project for a Ukrainian Catholic Catechism for youth, which is near completion. A number of members of the Patriarchal Catechetical Commission also gave reports on their work and activities. In liturgical matters, the Bishops also looked at the new translation of the Divine Liturgy of St. John Chrysostom and the Psalter, as well as ongoing projects for a new and complete translation of the Divine Office and especially the Menaion, which is the complete 12-volume collection of all the propers (special changeable liturgical parts) for every day of the year for all daily liturgical services - matins, vespers, etc. Reports and discussions were had on the structure and work of the Patriarchal Curia (the Church's various administrative offices and departments) and its development for a more effective realization for the decisions and directives of the Synod of Bishops. The central 'working group' of the Vibrant Parish 'Vision 2020' movement also reported on their work and plans for the upcoming year. To acknowledge the 75th year since his martyrdom and the 10th anniversary since his being declared as the Patron for Pastors of the Ukrainian Catholic Church, the Synod has designated 2019 as year during which special honour will be given to Blessed Omelian Kovch, who died at the Majdanek concentration camp at the hands of the Nazi regime. The year will also honour the Studite monk Blessed Clement Sheptytsky on the 150th anniversary since his birth, and co-founder of the Sisters Servants, Blessed Josafata Hordashevska on the 100th anniversary of her passing to eternal life. The Synod established a new Patriarchal medal, the "Metropolitan Andrew Sheptytsky Award" which, in the future, will be used to promote the honouring of the great Church figure and his work. During the Synod, the Bishops had their traditional day of spiritual renewal - a retreat that was led by Ukrainian Catholic University lecturer, Fr. Yurij Shchurko. The Bishops also made a trip across the border into Poland to participate in the historic celebration of the 350th anniversary the reconfirmation of ecclesial communion between the eparchy of Peremyshyl and the Apostolic See of Rome. This event was reported on this website [HERE]. The next Synod of Bishops will take place in September of 2019, with the theme of, "Communion in the Life and Witness of the Ukrainian Catholic Church". Синод розпочався Божественною Літургією в архикатедральному соборі Святого Юра у Львові, яку очолив Блаженніший Патріарх Святослав разом із митрополитами, архиєпископами та єпископами УГКЦ за молитовної присутності численного духовенства і вірних. У ній взяли участь єпископи з інших Церков свого права. У своїй проповіді Отець і Глава УГКЦ запросив усіх присутніх до участі у важливій справі - «пошуках для Бога сучасної людини». Предстоятель Церкви, звертаючись до синодальних отців, висловив переконання, що «сам Ісус Христос перетворює нашу синодальну зустріч на момент радості, на момент повноти» та запросив вірних УГКЦ підтримати синодальні наради постійною молитвою. Наприкінці Літургії привітальне слово виголосив Архиєпископ Клаудіо Ґуджеротті, Апостольський нунцій в Україні, який передав благословення Святішого Отця Франциска на синодальні діяння. У неділю, ввечері, у приміщенні реколекційного центру в Брюховичах Блаженніший Святослав очолив Молебень до Святого Духа та всі члени Синоду і допоміжний персонал склали присягу, яку зачитав найстарший із присутніх за єпископською хіротонією - владика Василь (Лостен). Під час Молебню синодальні отці молилися про Божу благодать і світло Святого Духа для праці Синоду. Головною темою Синоду була тема «Боже Слово і катехизація». Члени Синоду міркували, як ефективно передавати віру в сучасному світі. Головний доповідач, владика Петро (Стасюк), значну увагу приділив питанню видання та перекладів Катехизму УГКЦ «Христос - наша Пасха», вказавши на важливість цієї праці, бо вона єднає вірних УГКЦ у всьому світі. Для навчання правд християнської віри та єдності Церкви це є основний документ. Отець Роман Островський у своїй доповіді наголосив на тому, що Слово Боже є основою катехитичного служіння, а с. Луїза Цюпа, СНДМ, представила стан катехизації в УГКЦ, виклики та пропозиції щодо їх подолання. Синодальні отці проаналізували досвід катехитичного служіння в єпархіях в Україні та на поселеннях. Було відзначено важливість служіння катехитів у передаванні віри. Синод опрацював і прийняв відповідні рішення для того, щоб вірні УГКЦ у повсякденному житті жили Словом Божим, а передавання віри стало пріоритетом церковного життя, адже катехизація - це перший обов'язок кожного єпископа, священика і батьків. Синод також був ознайомлений із ходом роботи над Катехизмом УГКЦ для молоді. Для популяризації життєвого подвигу блаж. свщмч Омеляна Ковча Синод поблагословив створення Оргкомітету щодо вшанування його пам'яті у 2019 році з нагоди 135-річчя з дня народження, 75-х роковин мученицької смерті в нацистському концтаборі «Майданек» та 10-ї річниці проголошення його покровителем душпастирів УГКЦ. Наради єпископів УГКЦ перепліталися молитвою - літургійною і приватною, зокрема щодня о 21:00 звучала спільна молитва за мир в Україні. Болі та надії рідного народу, який уже п'ятий рік страждає від російської військової агресії, владики заносили до престолу всемилостивого Господа - Князя миру. У суботу, 8 вересня, члени Синоду Єпископів літургійно поминали усопших архиєреїв УГКЦ. Синодальні отці звернулися з вітальними листами до Святішого Отця Франциска, Папи Римського; Президента, Прем'єр-міністра та Голови Верховної Ради України; Вселенського Патріарха Вартоломея; Глав Католицьких Єпископських Конференцій Європи, Канади і США; Глав Патріарших і Верховноархиєпископських Католицьких Східних Церков; Предстоятелів Православних Церков в Україні.